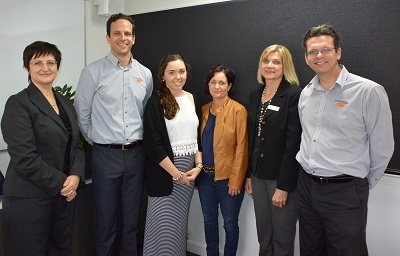 CQUni student Rachel Bates and her mother Lisa (centre), with Whitson Dawson representatives Vanessa Erasmus, Dave Whitson, CQUniversity Associate Lecturer Maree Franettovich, and Andrew Whitson. The newly established partnership between Whitson Dawson Certified Practicing Accountants and CQUniversity has enabled 18-year-old Rachel Bates to achieve her dreams and go to university. Director of Whitson Dawson, Dave Whitson, said the firm was excited at this new prospect to partner with CQUniversity and help a student achieve her goals. “We are constantly looking for opportunities to give back to our community and through the Whitson Dawson Youth Business Scholarship we are able to support students looking to further their skills in business, finance and accounting,” he said. Rachel Bates recently became the first recipient of the scholarship due to her standout submission chosen by Whitson Dawson Directors, Dave and Andrew Whitson. “Rachel really stood out to us as a suitable recipient of the scholarship as her application was exceptionally well written and showed that she had a clear focus of furthering her education,” he said. “Rachel will also be the first person in her immediate family to complete a tertiary education, which was something we wanted to help make happen. Whitson Dawson Youth Business Scholarship recipient, Rachel Bates, jumped at the opportunity to apply for the financial assistance, which now allows for her to complete a Bachelor of Business. “It’s a great pleasure to be the recipient of the scholarship, as you know that there are people out there who want to help you to achieve your goals,” she said. CQUniversity Dean, School of Business and Law Professor Lee Di Milia welcomed the partnership, and congratulated Rachel on the scholarship. "CQUniversity is proud to partner with a community focused organisation such as Whitson Dawson," he said. "Partnerships with business and industry are a vital way for CQUniversity to ensure our students have close ties to their potential employers, so as graduates they can fast-track into their dream careers. "Support from organisations and industry leaders such as Whitson Dawson helps encourage young people to study locally and, upon completion of their studies, use their skills to benefit the region."